Blockchain technology could give shippers, logistics providers and motor carriers new capabilities to share information and automate transactions. New technologies will also emerge that help companies differentiate their services in the rapidly growing sector of e-commerce and final-mile logistics. Emerging technologies will give transportation companies faster and more intelligent responses to market demands. New applications that use predictive analytics are already surfacing to give companies the edge in matching freight and making better use of their most precious resource — time. The same technology that powers the flow of Bitcoin, a digital and decentralized currency, has untapped potential to usher in a new level of automation and transparency to freight transactions. The technology, called blockchain, is a protocol for moving data from multiple parties securely through a network of systems. Blockchain moves the data in “blocks” that are linked together and protected by cryptography, making it difficult but not impossible for the transactions to be hacked, edited, forged or destroyed. And the transaction record of a blockchain, a digital ledger, is visible to all parties involved and is stored on their own computer systems. The future of blockchain in transportation and logistics seems inevitable, but the adoption rate could be slow unless software companies follow a set of common guidelines and open standards, says Timothy Leonard, Chief Technology Officer, TMW Systems. Efforts are underway to do just that. TMW Systems recently created an external group, the Blockchain Engineering Standards for Transportation & Logistics (BEST-L), that brings the software provider’s staff technical experts together with customers to help establish open engineering standards. Leonard, one of the experts in the BEST-L group, has been developing blockchain applications for nearly three years at TMW Systems. 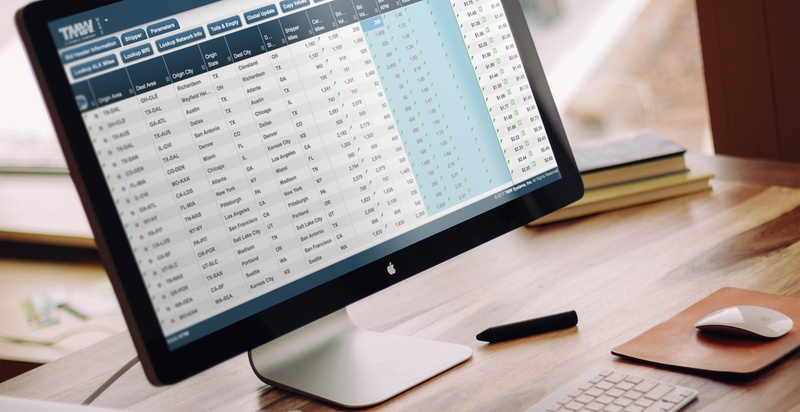 One block is part of the company’s bid management tool, Engage.Bid, that carriers and freight brokers use to manage pricing and bidding activities with shippers. With the Blockchain, carriers and shippers will be able to create “smart contracts” that self-execute by integrating bid processes with an RFP system that shippers use from 10-4 Systems. Blockchain makes smart contracts possible by automatically verifying and securing the movement of data in freight transactions, from rate quotes to shipment tracking updates, proof-of-delivery, invoice amounts and more, he explains. The digital ledgers of smart contracts will make it possible for carriers and logistics companies to have visibility of freight booking patterns with shippers, and vice versa. With this visibility, transportation companies will be able to verify if customers are keeping their lane commitments, he says. Blockchain transaction ledgers and solutions are also coming for driver retention, safety, freight matching, fleet maintenance and many other areas, he says. Software companies that have the capacity to build, consume, report and facilitate the exchange of information from multiple databases — operations, financial, maintenance, telematics and more — have the early advantage in this new frontier. For this reason, Leonard believes Trimble-owned companies TMW and PeopleNet are uniquely positioned. Growth of e-commerce continues to accelerate as consumers look online for products of all shapes and sizes, including from their local brick-and-mortar retailers. Forrester, a leading research firm, projects that 17 percent of all U.S. retail sales will move online by 2022, a significant jump from the approximately 12.7 percent of retail sales that flowed through e-commerce channels in 2017. 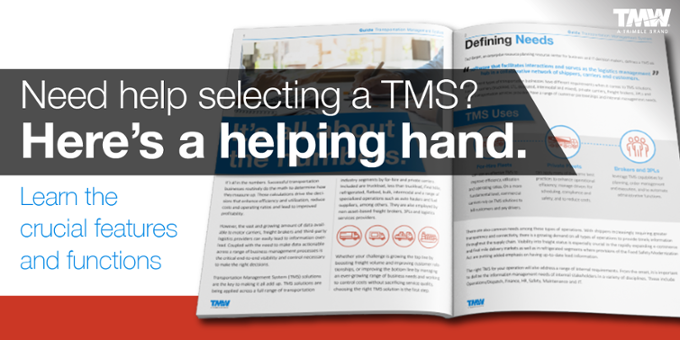 To keep up with the fast-paced demands in this sector of the economy, final-mile transportation and logistics providers are looking for new mobile data capture solutions, says James Stevenson, Vice President of Sales for TMW Systems. 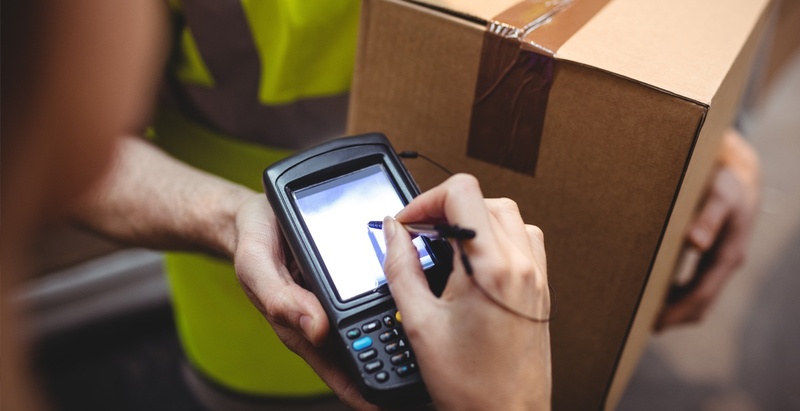 Final-mile deliveries require drivers to capture information outside the cab such as electronic signatures and various exceptions. Mobile data capture solutions will create a more efficient and “clean” invoicing process, he explains. In the final-mile space, companies will find it increasingly difficult to make exception-free deliveries and automate their invoicing processes by using technology from multiple suppliers, he says. Transportation and logistics providers that use end-to-end technology platforms can bring together mobility applications for driver compliance, behavior management and data capture with the planning, routing and dispatch systems in the back office. Having a fully integrated platform can help companies differentiate their services, he says, such as by offering accurate, real-time ETAs to customers waiting at home for deliveries, and by giving them instant notifications if exceptions occur. Final-mile delivery companies also can identify revenue and cost-saving opportunities by having their data in a single database for analysis. Besides expanding the business opportunities of commercial and private fleets, the growth of e-commerce will create demand for new and unconventional delivery services, Stevenson says. Certain types of deliveries are too expensive for a fleet, he says, such as Walmart’s curbside pickup service for online grocery orders. Reportedly Walmart now offers a home delivery option. Crowdsourcing transportation services will help brick and mortar stores stay relevant, he says. Consumers are already going online to search for pricing and inventory at local stores before they venture out to buy. And once buyers find items they are looking for at local retailers, crowdsourcing will give retailers the option to offer home delivery to capture more business from consumers. A number of emerging technologies will deliver information to fleets and third-party logistics providers to solve pressing challenges as truck capacity tightens due to freight volumes, driver shortages and regulations. Market conditions are already driving new requests from shippers, brokers and carriers to have more integration between TMS platforms for better visibility to capacity that is available today, and days into the future. Predictive analytics in the trucking industry has already paid big dividends in safety, risk management and driver retention by identifying and acting on early indicators to positively change outcomes. Technology developers are chasing another opportunity to apply predictive analytics to freight matching and load planning. Freight brokerage and logistics providers that use shipment visibility platforms from suppliers like 10-4 Systems have already eliminated the need for EDI communications and “check calls” to track shipments. These platforms use the GPS on drivers’ phones and ELD devices as well as cell tower signals to automatically track shipments. New applications from some of these providers, and new entrants, will be predicting when and where capacity will become available for use by shippers and 3PLs. In the second quarter, the Federal Motor Carrier Safety Administration plans to ramp up the enforcement of its electronic logging device (ELD) rule. Inspection officers will be placing drivers out of service who are not in compliance. The increased level of scrutiny for ELD compliance will go beyond roadside inspections. Groups who have been opposed to the ELD mandate from the start, like the Owner Operator Independent Drivers Association, may push for legislation that requires carriers to pay drivers for all time they log “on duty,” Fuller says. California labor laws already require fleets with interstate operations have to treat ELD records like payroll records to verify they are compensating drivers for all time on-duty, including for activities, like fueling, that is not considered productive. Industry adoption of ELDs, new regulations and the competition for drivers will move more states in the direction of California where carriers use hourly pay structures, predicts Fuller. This trend in 2018 and beyond will increase demand for more trip planning tools for drivers, such as apps that provide real-time information on parking availability. It will also lead to new developments in dispatch and routing systems using predictive analytics to help carriers make better use of their most precious resource — time, he says. Current and emerging technologies will also give carriers new insights on profitability with an emphasis on utilization of time — such as dwell, appointment, transit and detention times, says Fuller. None of these emerging technologies will live in a sphere of their own. Businesses will need all of them to work together as they continue to improve automation and the profitable utilization of their assets as a means of driving out waste.